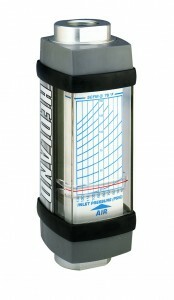 The Hedland Basic In-Line range offers a complete line of over 15,000 variable area flow meters to measure compressed Air and gases. In addition to the standard in-line models, these variable area flow meters are available in high temperature models and test kits with pressure gauge as well as digital versions with a choice of outputs. The Flow-Alert flow switches provide both visual flow indication and the capability to signal alarms, open or close circuits, trigger warning lights and buzzers, and shut down pumps or other equipment. For Air and other compressed Gases. » Available in meter sizes from 1/4" to 11/2"